American Son by Miami playwright and lawyer Christopher Demos-Brow play premiered at Barrington Stage two summers ago (review). It was obviously designed for a longer life. A New Jersey production followed (review). And now it's arrived on Broadway with a new cast, director and design team. While American Son focuses on a subject that is, or should be, very much on everyone's mind these days, I'm not sure it would have transferred from its regional premiere to Broadway without its leading character played by a box office magnet. That box office magnet is Kerry Washington, whose many years as Olivia Pope in the ABC TV series Scandal made her a star. For her return to Broadway (she made her Broadway debut in David Mamet's Race) she leaves Olivia behind and fully inhabits the anxious mother who's on stage for most of the 90 minutes we spend with her at the Booth Theater. Stephen Pasquale who plays her white husband is well credentialed as a leading man in musicals as well as straight dramas. Director Kenny Leon, the other two actors (Jeremy Jordan and Eugene Lee) and the busy set designer Derek McLane' all help to keep the play from feeling out of place in a Broadway theater. Fortunately, the Booth is one of the theater district's smaller venues and thus suits this four character, single set one-acter. 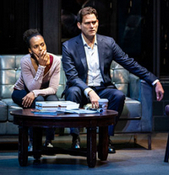 Though the Booth production is new in terms of its on and off-stage team, the story line is unchanged, as are the the characters, each of whom represents a different aspect of the theme being explored: Kendra (Washington), an African-American Psychology professor, her Irish-American husband Scott (Pasquale), an FBI agent. . . Paul Larkin (an excellent Jeremy Jordan), a white police officer and a tough African-American senior officer, Lieutenant John Stokes (an imposing Eugene Lee). The action still begins at 4 am, plays out in real time (90 minutes) and on a single set. As designed by Derek McLane with large windows to let us see as well as hear the storm raging outside (nice work lighting and sound designers Peter Kaczorowski and Peter Fitzgerald). That dismal weather outside reflects the clouds bound to explode inside. Even without the racial undercurrents, a child gone missing is harrowing experience for any parent. Given the long-standing history of "incidents" involving young black drivers being stopped by police officers, to escalate Kendra's fears — as facts revealed about him after husband Scott arrives escalate our sense that this isn't going to end well. The rookie cop's naively misguided efforts to deal with the agitated mother do provide some humor, especially so during his first meeting with Pasquale's Scott. But humor is a minor ingredient here. With the arrival of Lieutenant Stokes even Scott loses his usual cool. What's more, the crisis of Jamal's disappearance further exacerbate the painful fact that even love can't triumph over different racial attitudes. The slowly uncovered revelations are at times too heavy handed to avoid a sense of authorial contrivance, especially Kendra's lengthy monologue about the dreams that have reactivated her feelings of victimhood. With private schools having for years adjusted their admission policies to insure an at least somewhat more diverse population, I also thought Jamal always being the single non-white student at the private schools he attended a bit of a stretch. Still Mr. Demos-Brown is is to be commended for the interesting and highly dramatic way he draws us into the the conundrum of race as it affects all Americans and their sons and daughters. Cast: Jeremy Jordan (Officer Paul Larkin), Kerry Washington (Kendra), Steven Pasquale (Scott), Eugene Lee (Lieutenant John Stokes). From 10/06/18; opening 11/04/18;closing 1/27/1.